I gave birth to my dream, Nanny Poppinz after years of consulting and managing other Nanny Agencies. As a proud parent, I can now boast that we are open, offering Nanny services 24 hours a day, 7 days a week through our Nanny Poppinz National Call Center which supports our Agency locations across the country. The news is exciting and positive. We have 60 Nanny Poppinz agencies in 16 states and the District of Columbia with more in the queue. It is exciting for us to see the growth. But it is even more exciting to be helping parents solve their child care problems as well as to be helping Nannies find jobs. We have provided a Nanny to over 40.000 families to date and that number continues to grow. We have also provided jobs to more thousands of Nannies. We are working hard to bring a unique and high standard of child care to America. But while we are growing we continue in our belief that we must provide the highest quality child care possible. Our service is based on the principle "Created By Moms for Moms", which is not just a slogan, but also the way we do business. As a parent, I share the same concerns. We promise to address each and every one of them personally and resolve them, as we would desire a Nanny service to do for us. We recruit the best Nannies nationally by having a great reputation with the Nannies we currently have placed in happy homes. Due to the fact that these Nannies are being entrusted with not only your children but also your homes, each Nanny goes through an extensive screening process before they come to interview in your home. We will not refer a Nanny to your home that we would not entrust in our own and with my own children. 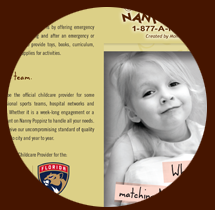 Each Nanny fills out our extensive application. From there, we verify their employment references, and conduct a thorough national criminal history check which includes a Sexual Predator/Offender list check. An application verification report is done as well as a DMV verification to check the driving record of each Nanny. Lastly we do an extensive Nanny internet search and check for each Nanny applicant. Our prices are reasonable and competitive. We are confident that you will not get better a Nanny service anywhere else. Plus, we guarantee our full and part time Nannies for six months which is an industry leader. Simply fill out a family questionnaire and we can then begin to work for you, helping you find the right Nanny to meet the unique needs of your family. As mothers, we truly care about providing you a Nanny service that tends to the needs of your precious gifts, your children.